Big Dig Day celebrates the start of the growing season and encourages people to visit their local Capital Growth-supported Community Garden. This year Capital Growth are encouraging wildlife-friendly growing. Maryon Park Community Garden, one of Capital Growth’s flagship gardens are taking part and have a Drop-in Open Day on Saturday 22nd April, 10.00 am to 4.00 pm. The Community Garden provides organic growing plots for local and retired people, a Forest School for primary schools and volunteer opportunities for individuals and corporate groups as well as educational visits for special schools. On Saturday 22nd April visitors can learn more about the Community Garden, enjoy tours and talks about the plots, orchard, wild flower bank, Forest School and the historic Maryon Park, location of the 1960s film Blow-Up. There will be refreshments including a pizza oven, children’s activities, a plant sale, and a fund raising stall. Visitors can join in with gardening activities or join the waiting list for a plot. There will be family events: PJ the Magical Clown at 1pm and Family Outdoor Art at 2pm. Maryon Park Community Garden is a not-for- profit voluntary project situated in the former council plant nursery in Maryon Park. Now in its fifth year, Capital Growth, the Olympic Transform Fund, City Hall, the Friends of Maryon Park, the London Tree and Woodland Trust, Greenwich Parks Forum and Tesco’s Bags of Help have help fund the Community Garden. “The Big Dig Day is about encouraging people and families to visit their local community garden. Whether you are an experienced gardener or new to gardening or just want to see how your local project is developing you will be welcome,” says chair Tim Anderson. There are 2,500 community gardens in London marking the start of the growing season. Capital Growth organise the Big Dig Open Day. 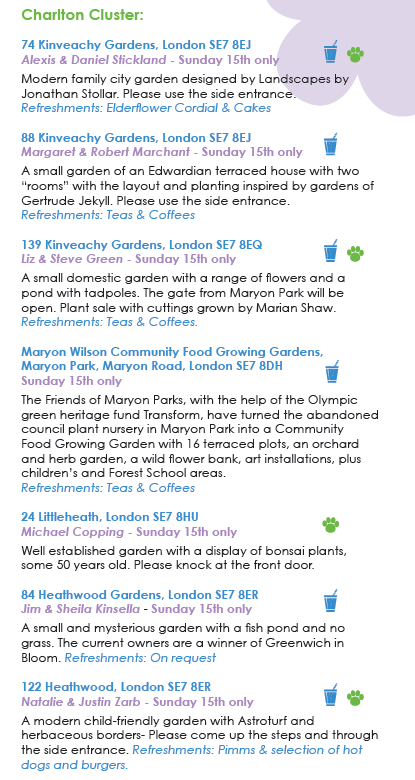 Maryon Park Community Garden is taking part and has a ‘Drop-in Open Day’ on Saturday 16th April from 10.00 am to 4.00 pm. The Community Garden provides organic growing plots for local people, a Forest School for primary schools and volunteer opportunities for individuals and corporate groups as well as educational visits for special schools. On Saturday 16th April visitors can learn more about the Community Garden, enjoy tours and talks about the plots, orchard, wild flower bank, Forest School and the historic Maryon Park itself. There will be refreshments, children’s activities, a plant sale and a fundraising bric-a-brac stall. Visitors can join the waiting list for growing beds. Maryon Park Community Garden is a not-for-profit voluntary community project situated in the former council plant nursery in Maryon Park. Now in its fourth year, the Friends of the Park, Capital Growth, the Olympic Transform Fund, City Hall, Greenwich Parks Forum and the London Tree and Woodland Trust have all funded the garden. “The Big Dig Day is about encouraging people and families to visit their local community garden. Whether you are an experienced gardener or new to gardening or just want to see how your local project is developing you will be welcome,” says Maryon Park Community Garden chair Tim Anderson. 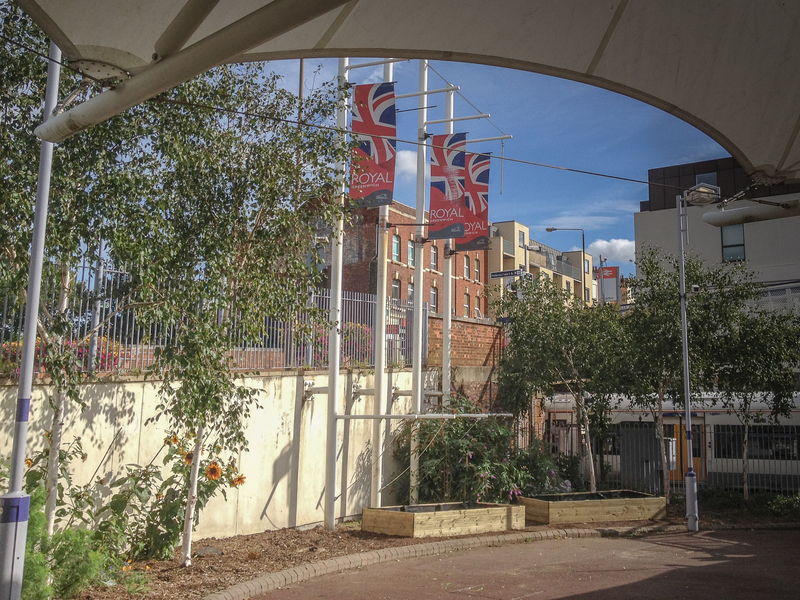 You’ll find the community garden by the Maryon Road entrance to the park – just look for the bunting. 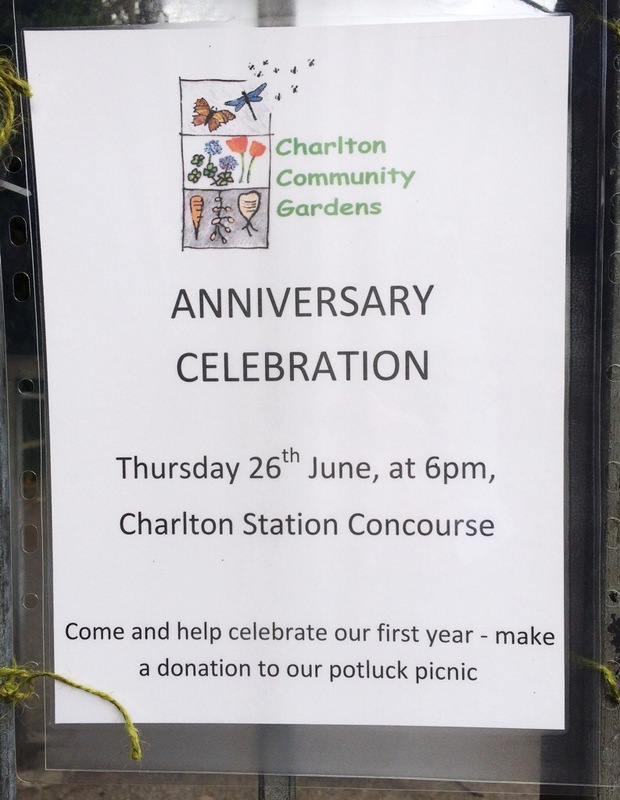 Charlton Community Gardens are celebrating a year of gardening at their Charlton station plot next Thursday, 26th June, 6-8pm. All are welcome: the Royal Horticultural Society will be presenting a plaque, and there’s a Pot Luck Picnic planned – including ‘tasty bites from plants grown in the demonstration garden’. This Wednesday, 18th June, sees a regular CCM gardening party and plant sale at the station concourse, starting 6pm. See Charlton Community Gardens website for more on what they’re up to at the station. You can download the full brochure with details of gardens in Greenwich, Blackheath, and Eltham here. Additionally, the same weekend sees Charlton Manor Primary school open its doors for the London-wide Open Garden Squares weekend, offering ‘Tea, coffee and homemade honey cake made from our own honey. Pond-dipping. Talk and exploration of our observation beehive. Tour of the garden with staff available to answer questions‘. Our Lady of Grace primary school could be rebuilt on a long-disused playing field in Highcombe if plans submitted to Greenwich Council get the go-ahead. A planning application has been submitted to move the Roman Catholic primary school from its oversubscribed site on Charlton Road onto the playing field, which has sat disused since the early 1990s since Christ The King Sixth Form College moved to Lewisham. The school site would be redeveloped into housing. The rebuilt school would have its entrance and exit on Lime Kiln Close, the cul-de-sac built on the site of what used to be St Austin’s boys’ school, whose playing field it was. Our Lady of Grace is one of six south east London schools in the running to have a replacement school built under the Priority Schools Building Programme – if the government gives it the funds and the council backs the plans, it could be open by 2015. While the plan (reference 13/2692/L) is due to be publicised in this week’s edition of council newspaper Greenwich Time, at the time of writing it can’t be viewed on the council website because of a technical fault. The proposal also affects the Charlton Community Gardens group, which had been proposing to use some of the land for a community garden. But with Greenwich Council committed to ensuring there is no loss of community open space (the disused field is shown on a map as just that, despite it being owned by a French religious order and having been out of bounds for two decades), the group is exploring options as to how it can attempt to secure some land there. This is the first of our regular gardening sessions planned for the first Sunday of every month. Those that use the station regularly will have seen 2 more raised beds installed and the newly planted wildlife-friendly garden. There’s still plenty to do before winter is upon us, so please join us any time between 2 and 4 pm this coming Sunday 6th October at Charlton Station. We have some tools and gardening gloves if you don’t have your own. Our next open meeting will be on Wednesday 23 October in The Old Library at Charlton House from 7pm We plan to have stalls featuring local projects as well as the usual Plant Sale and raffle. Come early to visit the stalls before the formal meeting starts at 7.30pm. The first part of the meeting will involve planning for the Highcombe site and will also consider how the station garden might develop. This will be followed by a quiz–questions on both gardening and Charlton. Please get in touch if you can spare some time to deliver flyers door to door in the next couple of weeks.